White Tie has provided outstanding service to Sedona for many years. Our professional drivers, and clean and well-maintained vehicles, offer a unique experience and exceptional ride for our clientele. We offer first class limousines at reasonable rates. Our fleet features stretch limos in 6,8 & 10 passenger sizes plus Party Buses up to 14 passengers & Exotic stretch SUV limos up to 18 passengers. We offer service in Sedona, Flagstaff and Prescott tri city areas. 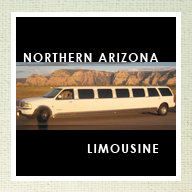 We also offer service to all airports including Phoenix Sky Harbor.